Adrenal Support | Supplement Offering Natural Stress Relief | Get Here! The formulation Adrenal Support is a new phytotherapy aid for combatting stress, nervous tension, anxiety and ‘burn-out’. It has been developed to support activity of the adrenal glands which play a key role in managing stress. Located above the kidneys, the adrenal glands produce and secrete hormones that promote the body’s response to stressful situations. The efficacy of this natural Adrenal Support supplement comes from the benefits of the medicinal plants it contains, including maca (Lepidium Meyenii), rhodiola (Rhodiola rosea), eleutherococcus (Eleutherococcus senticosus) and tulsi (Ocimum sanctum L.). All these plants are adaptogens, ie, they help the body adapt to different stressful situations. In particular, they boost resistance to stress by supporting the adrenal glands and normalising levels of the stress hormone cortisol. In addition to their stress and anxiety relief effects, the plants in Adrenal Support are recognised for offering benefits for general well-being. They help reduce fatigue, restore energy, improve performance and boost the immune defences. With wide-ranging effects, these plants can be described as powerful natural tonics! To produce an anti-stress supplement of the highest quality, Adrenal Support has been enriched with a selection of nutrients essential for healthy adrenal gland activity. In particular, it contains vitamin C (Ester C®) and zinc (orotate de zinc), two substances required for hormone production in the adrenal glands. It also contains L-tyrosine, an amino acid which is the precursor of two adrenal hormones: adrenalin and noradrenalin. To maintain equilibrium and well-being, this supplement also provides magnesium (magnesium dimalate) and vitamin B5 (calcium pantothenate), deficiency in which is known to promote peaks in stress levels, fatigue, headaches and insomnia. 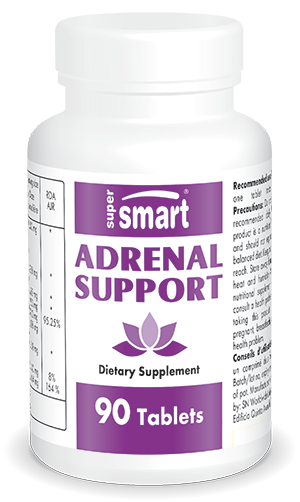 Based on extensive scientific research, the formulation Adrenal Support offers the perfect solution for managing everyday stress. It helps to reduce stress by supporting the activity of the adrenal glands, and maintain the body’s equilibrium by promoting well-being. For optimal efficacy, the recommended dosage of this new natural anti-stress product is two capsules a day. In cases of decreased energy levels and major fatigue, Adrenal Support can be taken alongside natural extracts such as the mushroom Cordyceps sinensis, popular in Asia for its tonic effect. You may also be interested in other health-beneficial mushrooms such as shiitake, with immune-stimulant properties, and reishi, with anti-ageing effects.